The Pilgrim… Tuscany, Italy. Daily Observations by Guillaume Groen. All roads lead to Rome. In a way this is true. Through the ages, every road that was built in Europe would end up on the doorstep of the ceasars and the popes in Rome. We now have a European high-speed motorway that brings you quick to every corner of Europe. But the ancient pilgrim routes still exist. Often used as a retreat or a way of meditating, pilgrims walk their way to Santiago de Compostela through the place of pilgrimage Lourdes or to Rome. 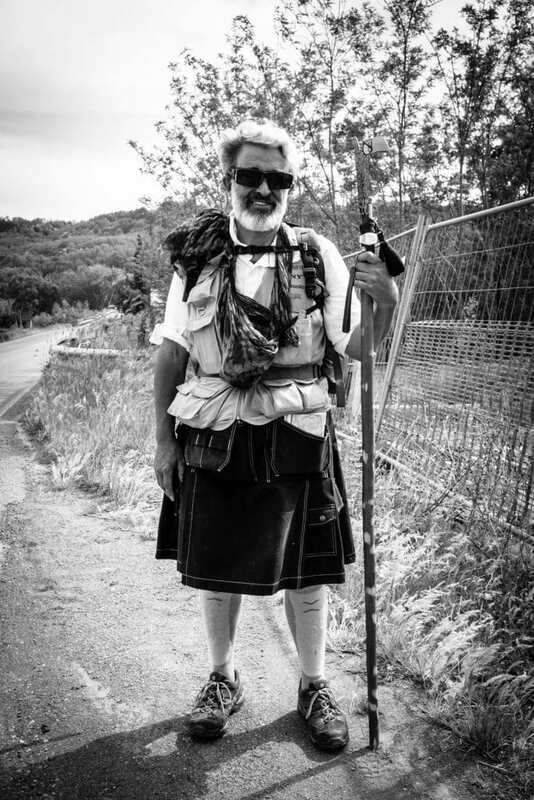 This Pilgrim was walking to Rome. A photographer, Photographing his journey from village to village and creating a book of his journey. Then buy this print or another item in the shop, if it is not yet available, please let me know via the contact page. I will be giving street photography workshops shortly. Are you struggling as a street photographer? Are you stuck in a creative rut or do you experience fear when approaching people while photographing on the streets? Do you want to know more on how I work the scene and create my images? Then go to the workshops page and check if a workshop is planned near you. If you have a question, please get in contact via the contact page. Or subscribe to the newsletter.